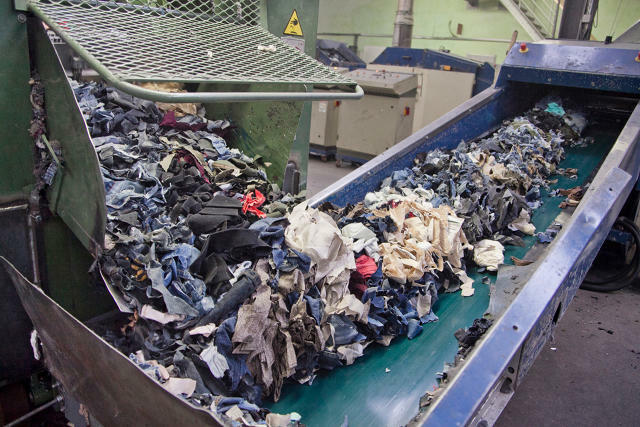 The company’s giant recycling facility in Germany receives hundreds of tons of old clothes a day. Can it find a way to turn those old clothes into new garments and make its business model sustainable? 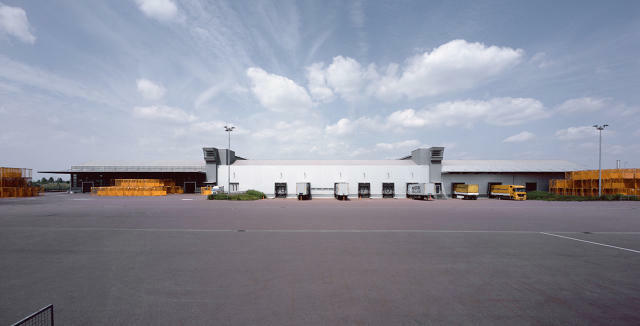 Two hours south of Berlin, in the colorless fields of Wolfen, H&M works with a massive textile sorting and recycling facility, one that might prove to be the unlikely looking future and redeemer of fast fashion. Around 25 to 30 trucks a day drop off an average of 14 metric tons of unwanted remainders from Europe’s closets, gathered from recycling bins at H&M’s thousands of locations on the continent. In Wolfen, this detritus of seasons past is industriously sorted for reuse, resale, and recycling, a relatively new trinity for the mass-produced clothing industry. With 4,200 stores around the world, H&M is the second-largest clothing retailer in the world (after Spain’s Inditex, which has 7,000). Its 2016 revenue is in the neighborhood of $20 billion. It takes a lot of $50 blazers and $10 T-shirts to get to that number, and the company tends to be the prime example of fast-fashion feeding unsustainable consumer habits and environmental damage. And while it clearly has no plans of stopping (the company’s growth target is to increase stores by 10 to 15% annually) it’s also investing heavily in fabric recycling innovations, in the hopes that it can continue to grow while creating a closed-loop system, where most (if not all) of the raw materials for its clothes come from fibers that were already used. A main feature of this plan is a partnership with a solutions provider called I:CO, which oversees this 13-football-field sized plant, which was opened by their parent company, SOEX, in 1998. (SOEX is a German textile collection and recycling group; I:CO is one of their subsidiaries.) Since 2009, I:CO, which is short for I:Collect, has run the Wolfen plant and since 2013, when H&M began garment collecting, everything left in their European stores has been trucked here. I:CO manages H&M’s in-store cast-off collecting all over the world, and runs two similar facilities—in the U.S. and India—for making zero-waste use of clothes, shoes, and textiles that would otherwise likely end up in landfills. “For us, the way forward is to create a closed loop for textiles where clothes that are no longer wanted can be turned into new ones, and we don’t see old textiles as waste, but rather a resource,” says Cecilia Brännsten, H&M’s sustainable business expert. The company first began to explore aspects of sustainability with the introduction of some organic cotton back in 2005, but the notion of circular production within their supply chain has really taken off just over the past few years, beginning with the 2013 launch of their in-store garment collecting initiative (you can now leave old textiles at any H&M store in the world). 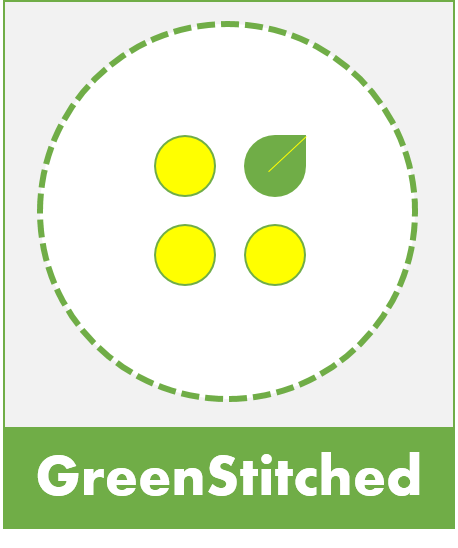 But keeping clothes out of landfills, while laudable, is more of a first step on the way to the main goal, which is changing the company’s supply chain to a so-called closed loop, thus making far more use of non-virgin fibers (as in, fibers that come from already-worn garments). The H&M Foundation is in the midst of a four-year partnership with The Hong Kong Research Institute of Textiles and Apparel (HKRITA), and has committed $5.8 million to develop the technology to recycle blended textiles into fabrics fit for new clothing. Fibers like cotton-poly are currently un-recyclable into wearable new material, a major obstacle to scaling up the company’s fiber-to-fiber recycling operation and closing that part of the production loop. I:CO doesn’t know the exact amount of cotton-poly it collects, but the amount of blended textiles it has been receiving has been on the rise, so finding a way to recycle these into fiber that can be used for new clothing is a problem that needs to be addressed. In 2015, the company joined forces with luxury group Kering to partner with Worn Again, a UK-based textile research firm. Worn Again is trying to address problems like the shortening of natural fibers, which occurs when fabric is re-spun. Right now, when clothes you buy are marked “recycled,” that’s only 20% true. The rest is virgin fiber, which has to be combined with the recycled stuff to make a wearable textile. This is the problem that the scientists at HKRITA are trying to solve. 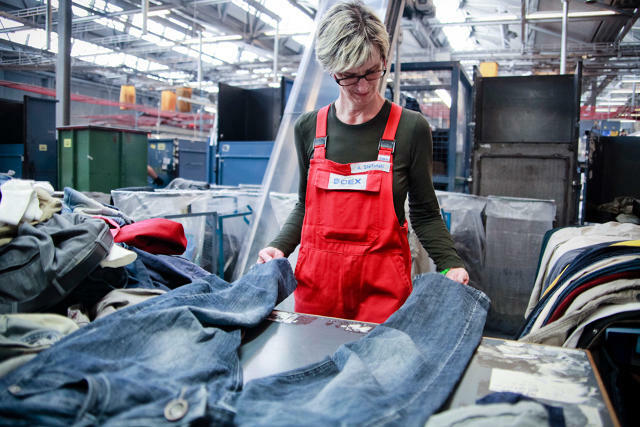 Both in speaking to its executives and in its exhaustive, public annual sustainability reports, H&M remains committed to finding a way to make all kinds of fiber-to-fiber recycling a major part of their closed loop materials, even if there is no target date yet in sight. In the meantime, at least, the company has produced 1.3 million garments with closed loop material in 2015 (it’s one of the biggest users of recycled polyester and organic cotton in the world) and H&M seems well aware that a future blended textile recycling capability is a key way to decouple their growth from new materials. 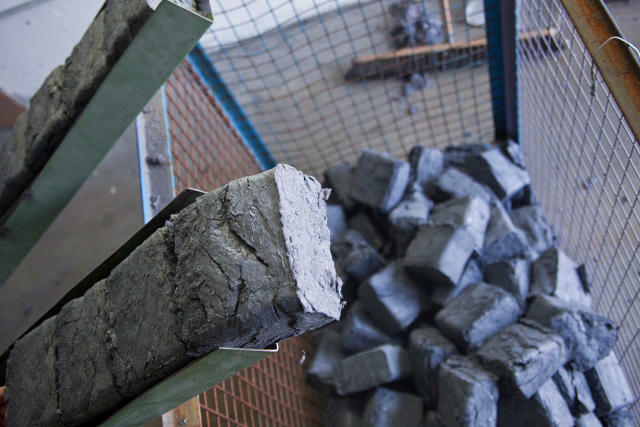 “There’s resource scarcity on one hand, and we have huge waste on the other,” says Brännsten. 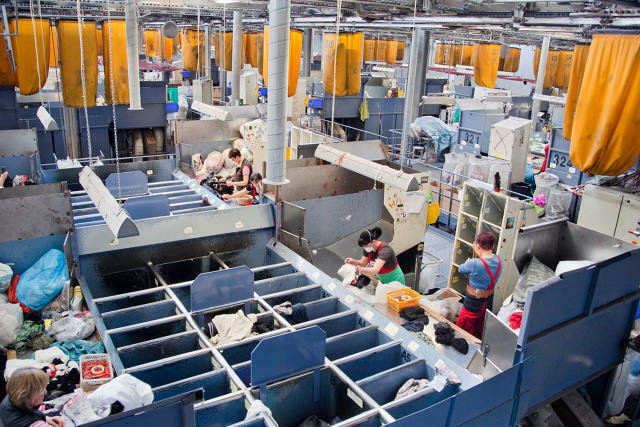 The multiple tons sorted in Wolfen on any given day are still minor compared to the 85% of discarded clothes that sent to landfills (the rest are donated), yet the operation requires seven hundred employees, most of whom work in the 24-hours-a-day business of sorting. I:CO says that salaries start above the German minimum wage, which is 8.50 euros an hour. They’re also offered health benefits on top of normal health insurance, like free physiotherapist visits in Wolfen, likely useful given that each person sifts through more than 6,000 pounds of clothing per eight-hour shift. The sorting process is based on 350 different criteria which determine whether your old jeans will be re-sold, partly re-used (zippers are handy that way), or fully recycled. Nothing that is fit for reuse, Brännsten stressed, would be recycled. Reuse extends an item’s lifespan, thereby lengthening the time it takes to go around H&M’s circular production loop. But everything in Wolfen is used, in one way or another. The most worn-out cotton items head to a shredder, where they are gradually broken down and repackaged into inviting bales of fluff, and become wipes and cleaning cloths. The absurd amount of dust produced by the sorting, shredding, and baling is sucked up into brickettes and sold to the paper industry. 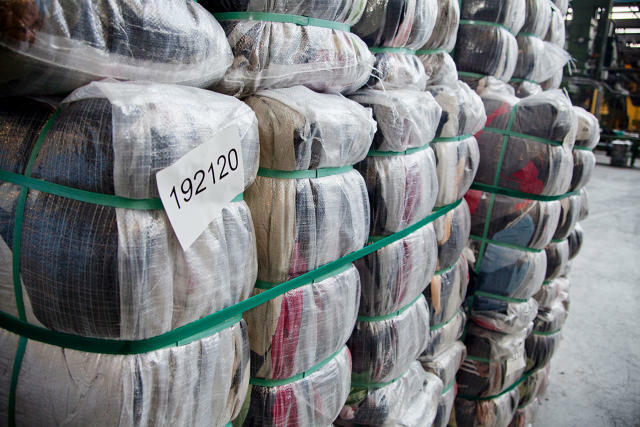 The reusable clothes—and about 60% of what ends up in Wolfen is still wearable—are sorted by type, fabric, color and quality, packed in 130 to 175 pound bales, and shipped to any of 90 countries (predominantly in Eastern Europe and Africa) for re-sale in used clothing stores. Customers who drop off clothes receive incentives, in the form of discounts or vouchers per bag of clothing. The idea is to make it as compelling as possible to get rid of clothing that would otherwise be trashed, and the incentives vary by H&M brand and home country regulations. In the U.S., a bag with at least three items (from any brand, and this can include stuff like old sheets) nets you a 15% discount coupon at H&M, while the same bag at the more upscale & Other Stories is rewarded with 10% off. Meanwhile, the proceeds from used clothing re-sale do not feed the company’s bottom line, but are donated to local charities and the H&M Foundation, which splits the funds between social and recycling projects, including the HKRITA partnership. At the stores themselves, the Conscious Exclusive collection gives organic and partially-recycled clothing a fancier vibe, while the affordable Conscious line might be in your closet already. Close the Loop, an understated recycled denim and knit line for men and women debuted earlier this fall, and is made with 20% post-consumer cotton and wool from I:CO’s India plant. The company uses about 20% sustainable materials overall—using organic cottons, linens, and leathers, recycled polyamides and polyesters, and now, recycled cotton and wool. So far, the company has collected about 34,000 tons of waste, or the weight of 178 million t-shirts, according to Anna Gedda, H&M’s head of sustainability. Of course, the equivalent of 178 million t-shirts over three years sounds less impressive next to the 550 to 600 million garments the company produces annually (this is based on outside estimates; H&M does not release production numbers). Its sheer size means “we will get criticized,” Brännsten says, throughout their ongoing move toward fuller sustainability. And certainly, the criticism the company receives for its unsustainable production pales in comparison to its issues with garment production and worker protections. While H&M has publicly committed to fair living wages and working hours for its garment workers, human rights activists on the ground tell a different story. The Clean Clothes Campaign reported last spring that Bangladesh factories who work with H&M were behind schedule on badly-needed improvements (like fire doors) and vendors in Cambodia and India were coercing pregnant employees to get abortions, lest they instead be fired. Any advances the company makes in terms of recycling science certainly must be balanced with a continued push toward worker rights and worker safety, or the quest for sustainability in its supply chain will be meaningless. Ultimately, the company “need[s] to ask I:CO, instead of the cotton field,” for new material, says Brännsten, noting that one effect of the company’s size is the potential of its influence over supply chains. In Wolfen, the U.S., and the India, already zero-waste facilities, the goal is to move away from down-cycling (the paper brickettes, wipes, cleaning cloths), maximize fiber-to-fiber recycling, and source all cotton sustainably by 2020. Developing cotton-poly recycling will likely speed up if and when H&M’s competitors get on board, too, Brännsten conceded. “It will not be called ‘recycled’ in the future,” she says, “because that’s the polyester that you get.” Walking through Wolfen, under hundreds of suspended sacks of discarded clothing, it’s believable that they are on their way. Now, for its efforts to outstrip the criticism of its business, what it needs most is a hard and fast timeline for that circular future. This entry was posted in Brands, Recycling and tagged Circular Economy, Circular Fashion, closed loop textile recycling, Fast Coexist, fastfashion, Germany, H&MConscious, H&MConsciousExclusive, HKRITA, I:CO, Kering, Recycling, SOEX, Wolfen, WornAgain.